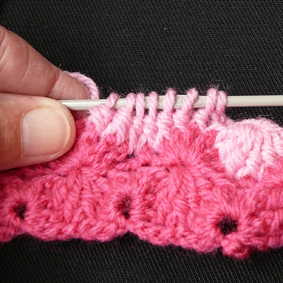 5th round - 1 single crochet in 1st single crochet, *7 double crochet in middle stitch of the 7 front post double crochet, 1 single crochet in 4th double crochet, repeat from * 1x, 7 double crochet in middle stitch of the 7 front post double crochet, end with 1 single crochet. 9th round - as 5nd round. 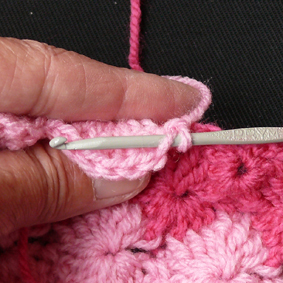 End with a round of front post double crochet. 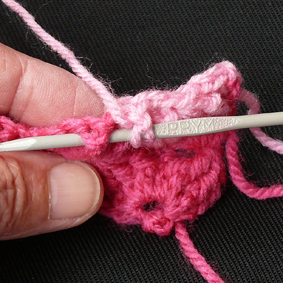 Begin at the middle of a side with 1 single crochet in a single crochet, 7 double crochet in the next hole as shown in the photo, 1 single crochet in the next single crochet. 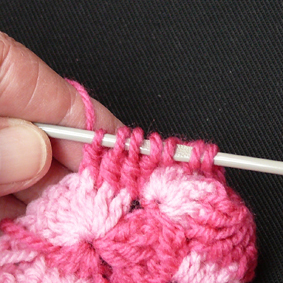 Crochet in the corner in the single crochet: 1 single crochet, 5 double crochet, 1 single crochet. 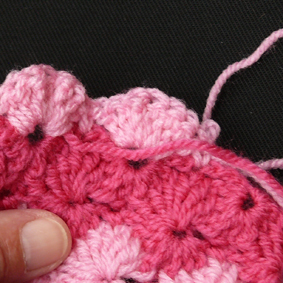 Continue around the border and close with sliptstitch. 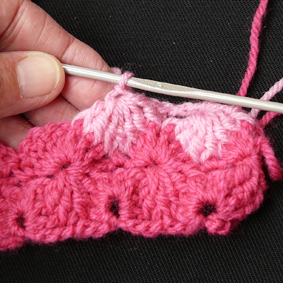 Turn for the next round, start with a new color on the 4th double crochet of 7 double crochet group. 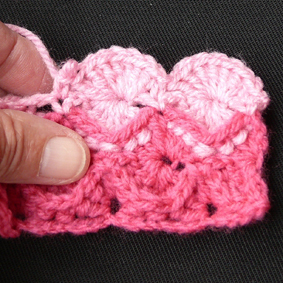 If you don’t change color, turn and crochet 3 slipstitches on the FRONT loop to the 4th double crochet. 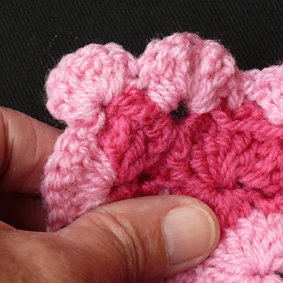 1 single crochet in the 4th single crochet, chain 1, 7 front post double crochet and so on.